(Bloomberg) -- Nike Inc. may have prevailed over lawyer Michael Avenatti’s alleged attempt to extort the company. But the case has shifted the spotlight back to an uncomfortable place for the sneaker industry: corruption and improper payments in youth basketball. Avenatti claims to have information about Nike employees funneling money to elite high school basketball players. If that sounds familiar, it’s likely because there’s an ongoing federal probe into similar actions that continues to bring more embarrassment to college hoops. Already, the investigation has led to multiple arrests and jail sentences for three men -- one a former executive at Adidas AG. The charges against Avenatti will do little to quell broader concerns about how youth basketball operates. And the timing -- just as fans celebrate the apex of the season -- brings another potential distraction to a National Collegiate Athletic Association with no shortage of them. Prosecutors issued an 11-page complaint detailing Avenatti’s repeated attempts to get Nike to pay millions to suppress allegedly damaging information. He claimed to know about Nike employees channeling money to high school players, they said. The complaint makes no judgment on the accuracy of the information Avenatti held about the world’s largest athletic brand. On Tuesday morning, less than 24 hours after his arrest, Avenatti doubled down. In a series of tweets, he hinted at payments Nike made to the mother of Deandre Ayton, the top pick in the 2018 NBA Draft, and Bol Bol, the son of former NBA center Manute Bol and current freshman at the University of Oregon. Avenatti mentioned a Nike executive by name, and added that federal prosecutors had been “played” by Nike and its lawyers. A Nike spokesman declined to comment. 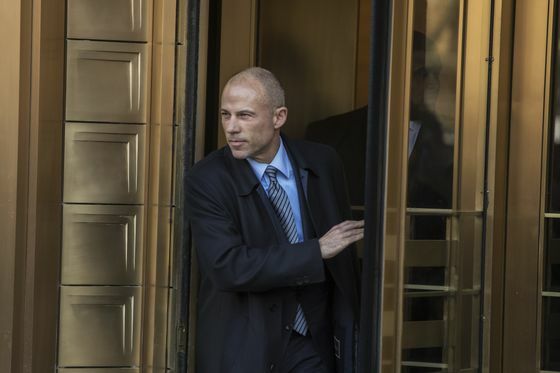 Prosecutors say Avenatti reached out to Nike earlier this month with details from a client, identified simply as the coach of an Amateur Athletic Union, or AAU, team in California. The squad had a sponsorship agreement worth about $72,000 per year that Nike had recently decided not to renew. The Wall Street Journal identified the coach as Gary Franklin Sr., whose former players include both Ayton and Bol. Avenatti told Nike’s lawyers that his client had evidence that one or more Nike employees authorized and funded payment to the families of top high school basketball recruits, and tried to conceal the payments. The complaint says Avenatti identified three former high school players -- who weren’t named -- and made reference to others. Originally announced in September 2017, the federal probe shed light on an underground economy for youth basketball talent that had become an open secret of sorts inside the sport. Money was funneled to top recruits and their families in order to sway their decisions on which school to attend, or which shoe company to sign with as a pro. That investigation spurred debate about the outsized role that sneaker companies like Nike, Adidas and Under Armour Inc. have in shaping youth basketball. Club teams, like those that compete in the AAU, are often sponsored by those companies and frequently play at tournaments organized by Nike or Adidas. The sneaker giants also pay tens of millions each year to outfit colleges across the country and -- further along in the ecosystem -- sign pros to million-dollar endorsement deals. Both Ayton and Bol played on an AAU team sponsored by Nike, and both chose to attend schools sponsored by Nike (Oregon is often jokingly referred to as the “University of Nike” because of Nike co-founder Phil Knight’s close relationship with the athletic department). When Ayton chose to go pro, however, he signed with Nike basketball rival Puma. Attempts to reach Bol through the university, and Ayton through his agent, weren’t immediately successful. Ayton’s name has popped up already in the FBI’s wider probe. Last February, ESPN reported that prosecutors had tape of University of Arizona coach Sean Miller discussing a $100,000 payment for Ayton. (Both Miller and Ayton denied any wrongdoing.) During a trial in Brooklyn in October, Adidas AAU coach and consultant TJ Gassnola, a key witness for prosecutors, testified that he provided payments to a handful of players or their families, including Ayton. While no Nike employees have been implicated in that investigation, the company’s grassroots youth basketball division was subpoenaed in connection with the probe. The scandal prompted some action from college sports’ governing body. The NCAA commissioned a college basketball task force to make recommendations about how to clean up the sport. Chaired by former Secretary of State Condoleezza Rice, the task force called last year on Nike, Adidas and their peers to show more financial transparency regarding business interests in youth basketball. The timing of the Avenatti news couldn’t be worse for college basketball, and not just because its annual men’s tournament is underway. The sport’s business model -- having top athletes play for free in front of millions of fans -- is facing an unprecedented level of scrutiny. In the past few weeks alone, the NCAA has been hit with a high-profile antitrust ruling, a proposed congressional legislation, and a new admissions scandal -- where families were caught bribing coaches to using their admissions sway to help admit nonathletes.